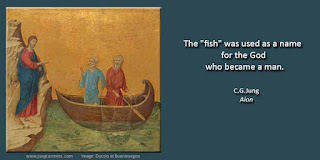 Carl Jung Depth Psychology: Carl Jung: The fish was the symbol of the unconscious life, like the Christ. It was here, on this day, that I first met Victor White. He was bathing in the lake when I arrived and I also had a bathe, so we met in the water. After tea we sat at a table in the front garden with C.G. and Mrs. Jung, a grand-daughter of theirs, and Father Victor White. C.G. and I had a talk for over two hours sitting by the edge of the lake. White had seen a snake in the water and as we talked we saw the snake twice; it swam along rather beautifully, about a yard long. I spoke to C.G. of a dream a patient had told me: he had a basin filled with golden-coloured water and in it were some golden fish; he had to drink some of the water. A fish fell out and he replaced it. C.G. said it meant that some of the unconscious was within reach and that he could take from it. 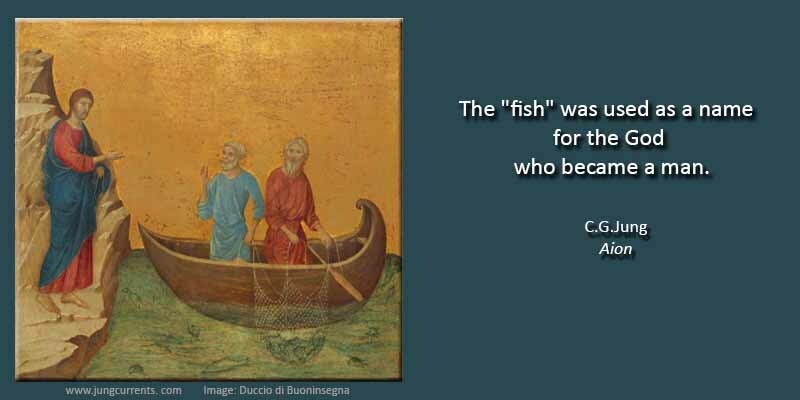 The fish was the symbol of the unconscious life, like the Christ. I arrived at Bollingen at three o’clock and had a bathe. The Jung’s were there with Father White and their grandchild Sybil. Sybil had a kettle being boiled on twigs. Then a chat with C.G. He spoke of the stages of life, for I had mentioned the importance to the younger generation of having grandparents. He had not known his; he said his grandmother died in 1864. He went on to speak of obsessional people as always fearing death; they want to remain adolescent and never grow up. Some patients (he cited a case) may even decline to shake hands with the doctor, who has to do with death. Adolescents have everything ahead of them; their decisions will be taken in the future. And the obsessional person is reluctant to decide anything. Nothing must be fixed for that would mean life was getting on, so there is hesitation over any decision, it must be possible to alter it, undo it – it is always reversible. Through their symptoms they retain an immature attitude and neglect their work, their duties in life. He mentioned the case of a woman who felt compelled to play incessantly on the piano, and to play a Different tune with each hand; this she did until she fainted and then she would start again. She came to him pleading for help. He told her that she did not want to get well, and he would show her this and see how she would then react. He asked her to carry out an experiment: for one day to do all the things a wife should do – get her husband’s breakfast, attend to his clothes and her household duties – just for one day. She returned still asking for help. ‘Well there it is!’ he said. drawing on the financial support of a schoolteacher who loved him though he knew his expenses were beyond her means (cited in Modern Man, I think). He had had a long Freudian analysis. This man blamed C.G. for moralizing when he told him, ‘There is your moral fault’, for we all have a moral side. He went on to speak of Freud and mentioned the importance to him of his dogmas. After many years without neurosis people can find themselves confronted with problems. In psychoanalysis they go back to early childhood things and in so doing escape from the real immediate situation. It’s like a river: in the early stages there are the little tributaries, and as it flows on, the channel deepens and the side streams dry up. But if the river is blocked in its course the water rises and flows back into the old disused channels again. But they are not the cause of the situation; the cause is the block in the river. And of course patients love to go back and back for this leads away from their problem, and there are always the endless things of childhood to talk of. But in this both analyst and patient are blinded to the present problem. I asked, ‘What cures?’ and he said, ‘You can cure with anything if you believe in it; you can cure neuroses with hypnotism, or with a walking stick, if that is what you believe in. He meant by it the real truth that we touch on now and then. We are related to everything – ‘to that tree’ – for we are all part of nature, and it makes a pattern. We cling to our consciousness as something big; but beyond it we can get into the stream of nature, the real unconscious. He mentioned also the I Ching, and an intuitive mediaeval system he had come across recently. After tea we sat in the tower room. Later I had a talk with C.G. in the study upstairs. He spoke of unmindful coincidences, that is, coincidences which could not have been anticipated. He gave an example of a dream he had recently of Churchill, and next day he read that Churchill had just passed through Switzerland. He added that on two previous occasions he had dreamt of Churchill and each time he had read the following day that Churchill had been in Switzerland at the time, or passing through; once was in 1944, when Churchill had alighted to refuel at Geneva on his way to Greece. In this context of synchronicity he mentioned the old notion of Correspondence (Swedenborg). He said the fundamental concept in physics was space, time and causation; when you had these three you had all that was needed. But there is more, namely that things happen together at a certain time. He alluded by way of illustration to the decay of radium, that after about 1400 years the granule of radium had gone. It diminishes at a certain rate; space, time and causation do not account for this. The comparison he gave was as if, say, sixty men sit down to dinner and each has a card with a time on it at which he must rise and go. One gets up, perhaps at two minutes past four, and another at four minutes past, and so on, irregularly, and seemingly at random. Gradually the room becomes empty. So it is with radium, it just ‘fades away’. Or the ice crystals which form on the window; no one sees two alike. Each atom knows its place; previously all were water, then there is the ice crystal with its axial pattern, quite perfect, and unpremeditated (by us).